The free graphical desktop field is dominated by two large software collections: GNOME and KDE. Both of them are very popular. This is rather a rare instance in the free software world; the Apache web server, for instance, has very few peers. This diversity is rooted in history. 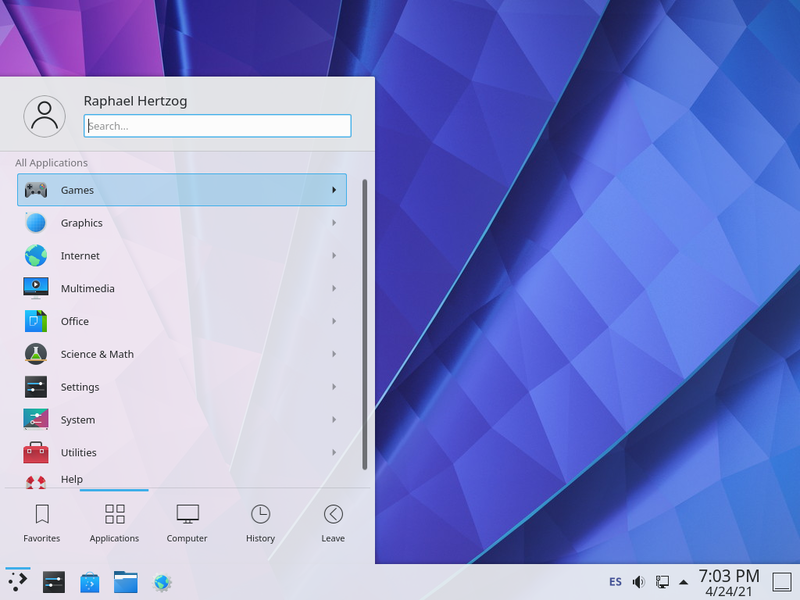 KDE was the first graphical desktop project, but it chose the Qt graphical toolkit and that choice wasn't acceptable for a large number of developers. Qt was not free software at the time, and GNOME was started based on the GTK+ toolkit. Qt became free software in the interval, but the projects haven't merged and evolved in parallel instead. GNOME and KDE still work together: under the FreeDesktop.org umbrella, the projects collaborated in defining standards for interoperability across applications. Choosing “the best” graphical desktop is a sensitive topic which we prefer to steer clear of. We will merely describe the many possibilities and give a few pointers for further thoughts. The best choice will be the one you make after some experimentation. 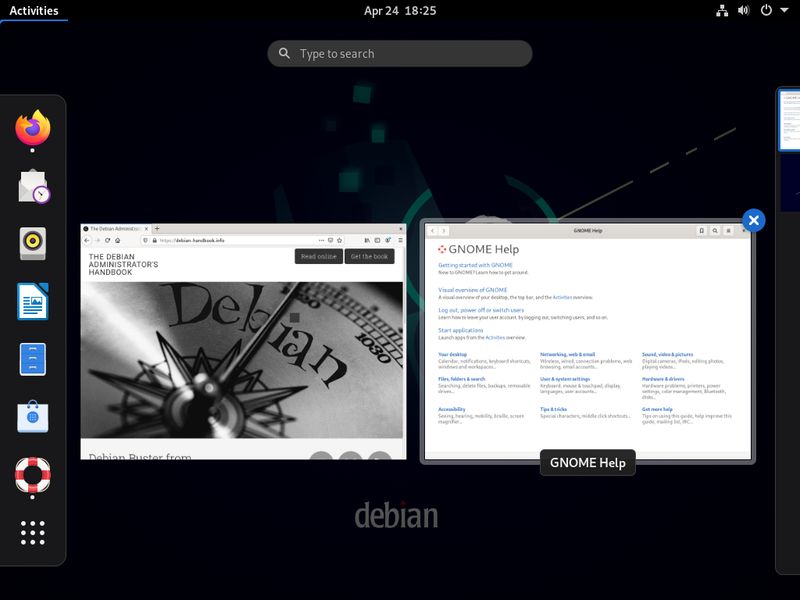 Debian Jessie includes GNOME version 3.14, which can be installed by a simple apt-get install gnome (it can also be installed by selecting the “Debian desktop environment” task). GNOME is noteworthy for its efforts in usability and accessibility. Design professionals have been involved in writing standards and recommendations. This has helped developers to create satisfying graphical user interfaces. The project also gets encouragement from the big players of computing, such as Intel, IBM, Oracle, Novell, and of course, various Linux distributions. Finally, many programming languages can be used in developing applications interfacing to GNOME. 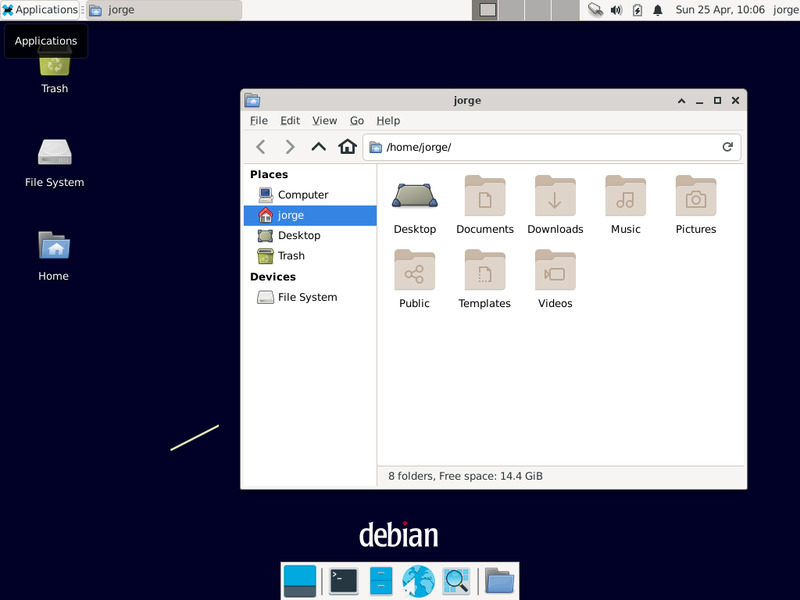 Debian Jessie includes version 4.14 of KDE, which can be installed with apt-get install kde-standard. KDE has had a rapid evolution based on a very hands-on approach. Its authors quickly got very good results, which allowed them to grow a large user-base. These factors contributed to the overall project quality. KDE is a perfectly mature desktop environment with a wide range of applications. Since the Qt 4.0 release, the last remaining license problem with KDE is no more. This version was released under the GPL both for Linux and Windows (whereas the Windows version was previously released under a non-free license). Note that KDE applications must be developed using the C++ language. Xfce is a simple and lightweight graphical desktop, which is a perfect match for computers with limited resources. It can be installed with apt-get install xfce4. Like GNOME, Xfce is based on the GTK+ toolkit, and several components are common across both desktops. Unlike GNOME and KDE, Xfce does not aim at being a vast project. Beyond the basic components of a modern desktop (file manager, window manager, session manager, a panel for application launchers and so on), it only provides a few specific applications: a terminal, a calendar (Orage), an image viewer, a CD/DVD burning tool, a media player (Parole), sound volume control and a text editor (mousepad). Another desktop environment provided in Jessie is LXDE, which focuses on the “lightweight” aspect. It can be installed with the help of the lxde meta-package.